My lovely friend, Katy-Rose recently welcomed her firstborn son into this wild and magical world. He’s a gorgeous little man, and I had the decided pleasure of crocheting a baby beanie for him! Katy-Rose requested a Halloweeny pumpkin design, which I was so super excited to make. 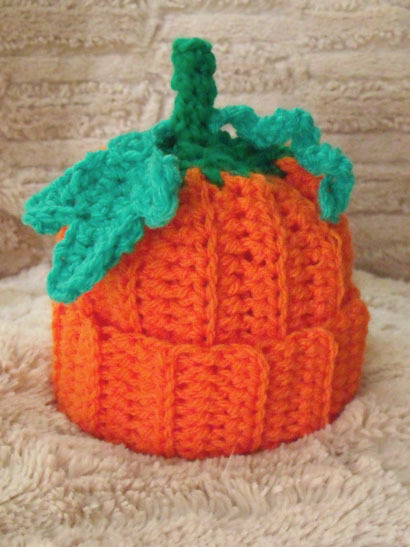 Not that I wouldn’t wear a pumpkin beanie myself, but I haven’t really had a reason to crochet any of the awesomely cute baby things, except my personal favourites: baby blankies. So as a treat for my interested readers, who have been asking for photos of things since I started talking about my projects, here’s the hat I made! All I really needed to do was look up online the best way to make the lines for the pumpkin body, and that turned out to be very simple! It was a flat rectangle, and you just crochet into the back loop for every row. Non-stitchers will probably think I’m speaking another language, and that’s okay. Trust me when I say this was a very, very easy thing to do (much simpler than many other things I’ve crocheted). The leaf and curly-q designs were just invented as I went, crocheting whatever worked to make it look right. The curly-q is just a chain with single crochets all along, and it curls naturally. Making the pumpkin shaped leaf was fairly basic, since I just kept adding stitches until it matched the photos I was working from of actual pumpkin leaves! I’ll hopefully get some other pieces finished soon, and take photos to share! Next Post Is this what we’re doing now? That really looks great! 🙂 Nice work. Thanks, Natasha! It was heaps of fun to make, too! You’re welcome! I’d imagine so.